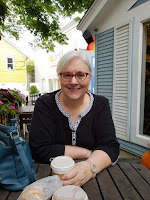 The latest project for my Great Big New England Genealogy Tour is to determine where my ancestors lived in New England. I wrote about using the "Who Was There" feature in my Roots Magic genealogy software, in April. Now, I am taking that information one step further. I am taking each place and confirming the county boundaries at the time my ancestor lived there. Colonial county boundaries changed and knowing what jurisdiction the county or district was in will help me find the records I need. Having this information when I go to the different repositories in New England will save me time and frustration, hopefully. 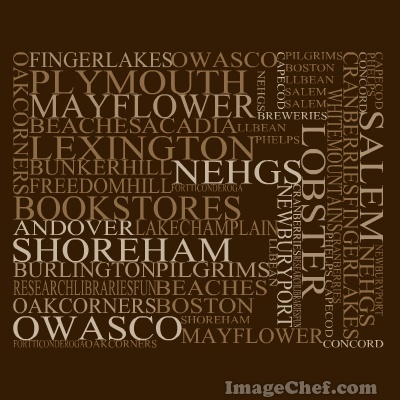 Next, I started a Pinterest board of New England, plus New York, historical societies. I plan to contact the societies before I go to make sure of their times and dates they will be open, or to arrange an appointment. Once I get the historical societies board complete, I plan on starting a library board. 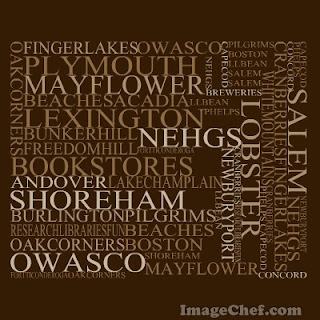 I will be looking for libraries in the areas my ancestors lived that have a local history section. Using local historical and genealogical societies, plus libraries, should make the best use of my research time. These are the people that know what resources are available and how to access them. If they are as wonderful as the ones I have used in Michigan, I am looking forward to this part of the trip. Have you used local societies and libraries when you go on a research trip? I want to prepare a few simple gifts to leave with those who help me? Is a gift or a donation appreciated, what do you think? If a gift, what kind of gifts would be appropriate? I was thinking of something local, but I'm not sure if they would like a box of cereal or pop tarts! It is only a few short months until I leave. I get excited, then overwhelmed, then anxious, but mostly I am looking forward to walking in the places that my ancestors lived. Even if my research is a bust, just seeing the area where they lived three hundred years ago and more will be exciting.